Celebrate Mother's Day at La Sala and enjoy an afternoon or evening filled with special treats for your mum, wife or mother-in-law! Lunch sitting from 13.30 - 16.00 and dinner sitting from 19.00 - 22.00. Live music from Susan Allotey, Masquerade and DJ Mark E Strutt and photographer available for that special photo. 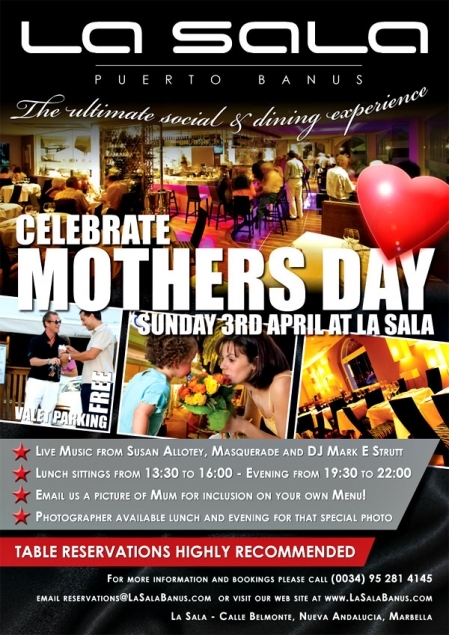 Also email La Sala with a picture of your mum for inclusion on her own menu!